As fans of James Bond wait impatiently for the next installment, they can at least take (quantum of?) 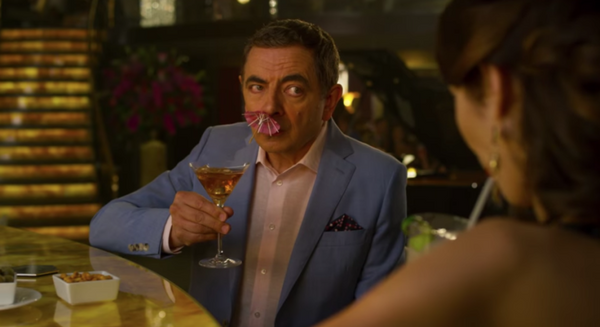 solace in the fact that there’s a new Johnny English film hitting theaters. Then again, Johnny English Strikes Again, the third entry in the spoof series, is so devoid of genuine wit that they might be better off staying at home and spending time mulling over who should play 007 post-Daniel Craig. Even fans of 2003’s Johnny English (raising my hand here) and 2011’s Johnny English Reborn (raising only a finger here) will be disappointed in this creaky comedy that finds Rowan Atkinson again essaying the role of the bumbling British agent who’s decidedly less Bond and infinitely more Clouseau. The plot this time involves English’s efforts to expose a Silicon Valley whiz kid (Jake Lacy) plotting to gain digital control over every nation. Olga Kurylenko, who played the female lead in the 007 entry Quantum of Solace, appears here as a Russian spy, while Emma Thompson is on hand as the British Prime Minister. Yet only Atkinson matters (although I did appreciate the cameos by the veteran actors playing retired MI7 agents). The British comedian (who, by the way, did once appear in a Bond flick himself, portraying Nigel Small-Fawcett in the non-series effort Never Say Never Again) once again throws himself in his role, but the material just isn’t there this time. There are a few bright bits scattered about, but most of the gags are on the moldy order of English getting stuck inside knight’s armor or smacking someone with a baguette. Such a reliance on antiquated gags of this nature patently marks this film as a Johnny-come-lately.